Stringing a multi-strand bracelet takes a little more planning than a single strand, but can be well worth the extra time and effort for the dramatic impact of the finished jewelry. 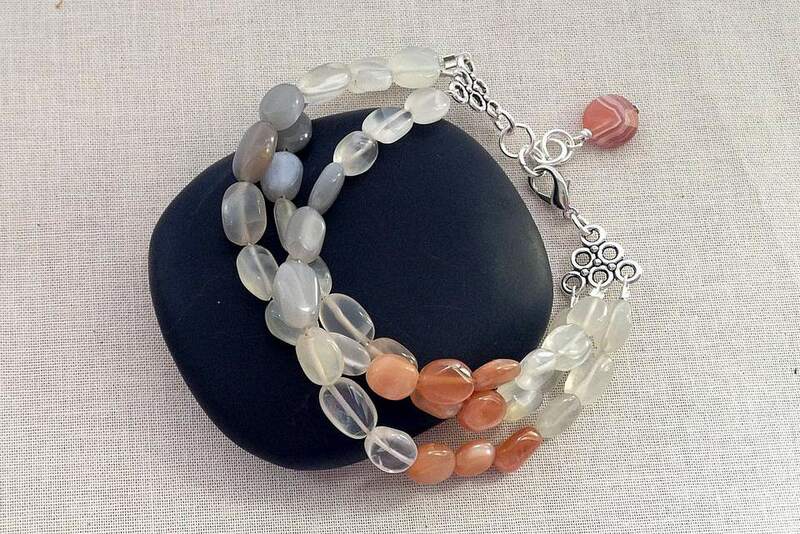 This multi-strand bracelet is made with gray, white and peach oval polished moonstone beads. One of the nicest features of a bracelet like this one is that the strands are laid out in rows, but by adding one or more twists before clasping the bracelet, you can get a twisted more casual look. This bracelet was made using my new Om Tara crimp pliers as an experiment to see if the ones crimped with the Om Tara hold better than regular crimps. I find that using a jewelry bead board is helpful when stringing necklaces or bracelets - even simple single strand ones. When I make a multi-strand design, I always prefer to organize and lay out the design using one. First, I sorted the moonstones by color. Then using the parallel channels on one side of my necklace bead board, I planned the design and arranged the beads. The channels keep the beads in place and the measurements along the side help me know when I have enough beads in place. This bracelet was planned around these pretty multi-strand connectors. The connectors can be used in a variety of ways, but I like their flat profile and knew that they would be comfortable on the bottom of my wrist when I am typing or writing. I love chunky bracelets, but sometimes I find they can get in the way or hurt when I need to put my wrist on a flat surface. Along with the two multi-strand connectors, I am using Beadalon 49 strand silver color stringing wire and beadalon crimp tubes. I like the silver color wire since you can see through the moonstone beads and it keeps the holes from looking dirty. For each strand, I used a piece of beading wire about 9 inches long. From a tools perspective, you will need crimp pliers, flush cutters and chain nose pliers. I am using my new Om Tara crimper pliers for the first time! Last, you will need a clasp and jump rings to finish bracelet. Attach the first bead wire to the multi-strand connector using a crimp tube and crimp pliers. I like the Om Tara crimp pliers because it is a single step to secure the crimp - you don't need to fold it over to secure it. If you are interested, this a good article on the differences between a traditional crimp tool and the Om Tara Crimp tool. Add beads to the first strand of wire. I like to secure them with a bead stopper while I am working. That way I can make sure all of the strands align and are the same length before they are attached to the connector. The bead stoppers I use are springs from a hardware store, but there are similar products made especially for holding jewelry strands like these bead bugs from Fire Mountain Gems. The only difference is that the jewelry ones have plastic covered ends (and cost a lot more). I purchased an assortment of 200 springs from Harbor Freight tools for about $5.00 - so I have enough to last me a long, long time. To use a spring or bead bug, bend the coils of the spring apart and slide the beading wire in below where the beads are. The spring needs to be tight enough to hold the beads in place. Attach the second strand of beading wire using a crimp bead and string the beads. Secure the beads in place with another bead stopper on the end. Add the third strand of beads to the connector the same way as the first two. At this point, you will be able to lay the strands flat and make sure the beads are aligned like you like them, the colors are laid out nicely and everything looks great before you complete any strands with crimp beads. I really like having the ability to make little changes at this time without having to cut of crimps or re-do strands. Once you are happy with the design of your bracelet, secure the strands to the second connector with crimp beads. If the holes on your beads are large enough, it is nice to be able to thread the beading wire through at least one bead before trimming the tail. With gemstone beads, that is rarely the case, so I try to trim close to the crimp, while still leaving a little bit of extra wire. Once all of the wires are crimped, you can test the crimps are secure by giving a tug on each side of the bracelet. Yes - I hate doing this since sometimes it isn't secure and will come loose, but better now than later!! I have to admit, I pull hard because I would much prefer my bracelets break at this point, than when someone is wearing them. I added a lobster claw clasp with a small silver jump ring to one side of the connector. Then I added several larger jump rings that act as an extender chain so the bracelet is slightly adjustable in size. I always complete my bracelets with a charm or dangle on the extender side - in this case a faceted 10 mm agate bead. The bead on the extender chain will help keep the clasp on the bottom of your wrist, add decoration and most importantly - make it easier to put the bracelet on. When you drape the extender chain over your wrist, the dangle will help keep it from sliding off your wrist before you can catch the clasp in one of the loops.